Should the Pentagon be Propping up Dictatorships around the World? 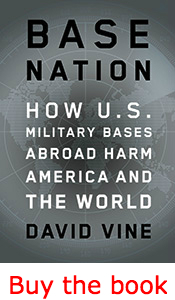 David Vine, a TomDispatch regular, is associate professor of anthropology at American University in Washington, D.C. His latest book is Base Nation: How U.S. Military Bases Abroad Harm America and the World (the American Empire Project, Metropolitan Books). He has written for the New York Times, the Washington Post, the Guardian, and Mother Jones, among other publications. For more information, visit www.basenation.us and www.davidvine.net.